How can I reuse or recycle plastic water bottles? | How can I recycle this? How can I reuse or recycle plastic water bottles? Last Friday, before setting forth on an expedition that would involve standing in the sun and shouting for a long time, we decided to gather all the water bottles in the house and refill them to take along. We’re not fans of bottled water and only buy bottles when we’re in a bind, so it was quite surprising to see how many we had accumulated around the house. We only need so many for reusing as water bottles* for over the summer so what can we do with the rest? 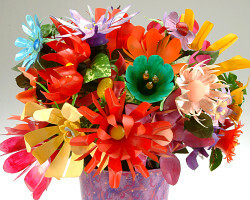 What are your favourite reusing or recycling ideas? Reduce: Install a water filter at your home and carry a refillable container with you so you don’t need to buy water wherever you go. Reuse: Use it instead of a water-displacement brick in your toilet cistern to reduce the excess water flow. Or cut the top bottom off and use it as a mini-greenhouse for your seedlings in the garden. Recycle: Most water bottles are PETE (Number 1 plastic) which is widely recyclable so you’ll probably be able to recycle it with your other plastics. If you grow any seedlings, flowers,fruit or veg, the bottles can be used as mini cloches by cutting off the bottom (which can be used as small pot saucers) and placing over the plant, in the ground and in the house and garden. It may be necessary to hold down using a piece of wire coathanger pushed into the soil through the neck of the bottle. PET 1 and 2 bottles are easy to recycle and go on to be re-used as anything from fleece clothing to roadside safety barriers. 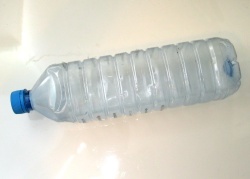 I don`t have the slightest hesitation about re-using them as water bottles, just rinse the cap well. I think it is a ploy by the mineral water producers to make us buy more. If you make any drinks e.g. elderflower fizz,ginger beer, wine etc. 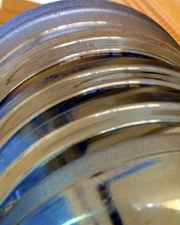 the bottles (water only) are excellent particularly as they will withstand high internal pressure. I fill a couple up with water and leave them in the freezer – great for using on picnics and trips to the beach as an ice pack. You can also use the middle- without neck and bottom- for watering your plants without causing erosion. You can cut the tops of the bottles to use as funnels – I have a whole range of size in my shed for using around the garden. You could fill one or two of them and keep them in the car i case you overheat. We have learnt to do this from experience! you can make a boat that you can lay on and tan while floating on water. There is a way to make bird deterrents for gardens/allotments with them, involving cutting sections and bending them out like sails so they spin round. I’m not sure exactly how you would go about this though..
You can make a vase out of these bottles. PLASTIC BOTTLES WITH THE NEXK REMOVED MAKE GOOD SWEED PROPOGATOR COVERS! Small flowerpots especially, but hey! it depends on the size of your bottle! I keep an empty 2-litre bottle in the boot of my car, in case I run out of petrol. It’s only happened once, but the plastic bottle was very useful then! Except you’re only supposed to use approved containers to fill at petrol stations. It’s a fun project for kids, too. I reuse my water bottles by filling them up with iced tea, flavoured water, or just plain water for future hikes or hot days. Note: be sure to clean each bottle and let dry thoroughly to avoid bacterial growth. Apart from filling water for the fridge, picnic use, I would cut the bottles into half and use it as small pots for cactus, stationery holder or just keep a few bottles of plain tap water in the car, in case someone needs to clean up or the car runs out of water. I saw it done on TV and they used markers to color it and strung them up with fishing line for a cool summer window display, could make mobiles too. That is actually very cool! You cannot tell it started life as a soda bottle. Make a float, place a pot with hanging plants on it and arrange in your pond. Fill a bottle up with sand and put it in your toilet tank to min. the amount of water your toilet uses. most of the older models use waay too much water. We also use water bottles to water our plants instead of buying a watering can. They’re great for marinades. If you have too much, you can transfer your leftovers into a smaller bottle (using the top of another water bottle as a funnel), label it and either freeze it or store it in the fridge. Just keep in mind, if you’re reusing the bottles to store food or drink, you wash them out properly and let them dry out thoroughly after every use or you could end up getting very sick. A friend of mine takes Poland Spring bottles (the cheapest, thinnest, most pliable plastic bottle you’ve ever seen) and he squeezes the bottom so it’s almost flat, then he crams it in between the Y-shaped space between the wheel and metal part of his bike. When the tire rubs against the bottle, it makes a sound like a motorcycle. Cool, but often annoying. You can cover them by making a tube from old jeans, canvas, or other heavy duty fabric, and giving to your dog to play with. They love the sound the plastic bottle makes when they chew on it and will love playing catch and other games with you as well. If you have one of the really cheap poland spring bottles, with the thin caps, use a sharp screw to twist a hole into the bottom of the cap }////> ] (this way so that the water squirts out properly) Then they can be used for watering plants, washing hands, squirt guns, etc., just don’t drink from them after you squeeze the hell out of them. If you cut them horizontally, you’ve got a quick funnel. It’s good that everyone, well almost, is recycling plastic bottles these days. We also need to be more inventive with recycling, such as recycling milk jugs and rice sacks. LOFT INSULATION…. 2 litre bottleS – i squash them flat place the lid back on to stop the air getting back in. The start saving them up in large clear plastic bags (from deliveries) when nearly full of squashed bottles tie the top off and dot around all over the loft for amazing extra insulation! I am collecting plastic drinks bottles to make a greenhouse. I saw this on a welsh tv programme and thought it a brilliant idea, although I am still working out how exactly I can do it, especially the roof. I cut the bottoms off the bottles (hot knife) and thread them onto a long cane. Its still in the experimental stage as yet!! That’s very cool – my only worry would be that those bottles might not last very well in strong sunlight. I actually have a couple green houses. I usually melt other plastic together to form a hard plastic sheeting, but if you have ever seen houses that have windows made from old glass bottles, It’s the same concept. Accept you don’t use mortar in between. It actually turns out pretty cool. And especially considering the plastic sheeting you buy from the hardware store is expensive, and always breaks under the weather. This way you can increase strength without sacrificing your wallet. The good plastic is EXTREMELY expensive. Heather, do you have any pics up online or a link to a blueprint. I am very interested in trying this! I have a dog and used to use a 2 litre bottle of water bought especially for this purpose) refilled to wash off muddy wellies before getting into the car. An old news paper was put on the floor of the drivers side fulfilling two purposes; absorbing any remaining mud on the soles of the wellies and helping to dry them. I now have two 2 litre milk bottles instead; their shape is more practical and easier to fit into a door ‘pocket’ than round ones. Please come and join…flickr is free! 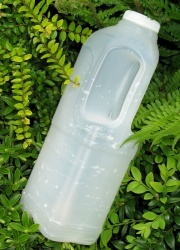 cut off the “funnel” top of any plastic bottle, feed the open side of any plastic bag thru from the bottom side, fold the open end over the threaded neck, screw on top. you have a sealed container…no more twist ties. if disposed the volume should be minimised before-open the screw cap step on the bottle and close the screw cap-this saved a lot of transport energy. Efried: Plastic bottle caps are NOT recycled at all. Never screw the cap back on!!! Its a completely different chemical composition then the bottle itself, and most likely will negate any recycling of the bottle itself! BOTH will wind up in the landfull…NOT recycled. Always remove metal and plastic tops from any kind of bottle…glass included…so its easier to separate and sort out at a recycling facility….which most now are using machines to sort…not humans. So a machine will get confused if the cap is on the bottle and toss it into a landfill dump pile. That is REALLY interesting Alison! I stand corrected…I went to our facility web page and found out its ok to leave the caps on!!! though I have read repeatedly on other sites NOT to do so. Go figure. Sorry for the confusion! Recycling CAN be confusing. but I learned something today. My sincere apologies to the group and Efried. I would say to inquire of each person’s individual community to keep up with the continual changes…and all the how to’s of recycling. my local preschool uses drinks bottles to make sensory toys for the children. glitter, or small plastic animals, or pen lids, or small sea shells, so when they are shaken they look really nice. the seashell one makes a nice tink tink noise! I’ve just thought of one while reading a reply. FLOATING POOL TRAY! just get a lightweight, round tray, and stick them (using waterproof glue) to the bottom of the tray. try and get them all around the edge, and cut them so they’re smaller if you need to. ive tried it and it works. its great for getting a drink while in the pool. Refill with juice,make a cup, store beads, cut top off and unskrew lid…funnle,water plants,captire lightning bugs,fishtank,mini byome dome,sand art,dry out flowers and refill!!!!!!! Wouldn’t it be a great world, if we did NOT purchase ANY bottled soda, water, or juice. Creatively reusing doesn’t make the ultimate problem go away…don’t buy the products in bottles. I reuse the plastic bottles for making airtight packages. All that we need to do is to cut the bottle’s neck leaving some space below the cap and use it for sealing lose packets(especially groceries). I found it very useful, hope everyone feels the same.. Researchers have developed technology that converts plastic waste into cooking gas without causing pollution. The eco-friendly and cheap method involves breaking down shredded plastic waste at an elevated temperature without oxygen, and could help create a more affordable and sustainable gas source for people around the world. I made jewelry items out of empty bottles. Sufferers of the painful foot condition plantar fascitis are told that it’s therapeutic to roll an object under their arches such as a tennis ball, can or small bottle. Recently I heard that it’s particularly helpful to roll something cold, rather like using an ice pack on an injury. So you could chill or freeze a 500ml water bottle and bring it out to roll it underfoot. Or else try heat instead by filling a bottle with fairly hot water. I am reusing plastic bottle from Vanilla Extract. I found medicine dropper with the lid from old medicine, which fits the bottle, and use it as a topper for this bottle. It could be used to feed orphaned pet, for mechanical oil, other fluids, but I use it for dishwashing soap, so I can dispense it precisely, down to a drop. Another tip for reusing plastic bottles. When on camping safaris in Africa cut off the bottoms and use as ‘chic’ tumblers for those G and Ts whilst watching a magical sun setting over a lake filled with hippos, using the bonnet of the safari jeep as a bar, in goodly company! Use as a funnel , Use the top cap bit as as sealer to seal the bags . and can cut the bottom bit off then , make a hole on the cap, fill with water then it will use as a self watering for the plants. you can use them for the bird feeder as well. I use them to keep the plant seeds to store for next year and keep it in the dry place. Self Watering Plant is a good idea as well especially when we are on holiday.